Unrivaled Belle broke her withers when she fell backward waiting to be saddled for Belmont Park's Ogden Phipps Handicap Saturday, according to David Grening in the Daily Racing Form. Her connections announced her retirement early Saturday evening. Trainer Bill Mott expressed frustration over what he felt was an inordinate amount of time Unrivaled Belle had to spend in the saddling paddock. 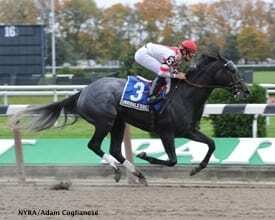 This entry was posted in Bloodstock and tagged bill mott, Unrivaled Belle by Paulick Report Staff. Bookmark the permalink.